In the final analysis, there two types of people: those who scrub floors with a traditional mop and those who use devices such as Bee mops, spin mops, or Swiffers. Mop people don’t mess around. They are normally responsible for the cleanliness of large areas and require equipment that can perform the job quickly and effectively. If they are not sweeping a heavy mop across the floor, they are following behind a self-propelled scrubber. The following review of Vanigo’s new electric mop will be of little interest to mop users. This device would be considered a distant and hopelessly low-powered descendant of the industrial floor scrubber they use at work. Most of us, however, can be lumped into the Swiffer people category. 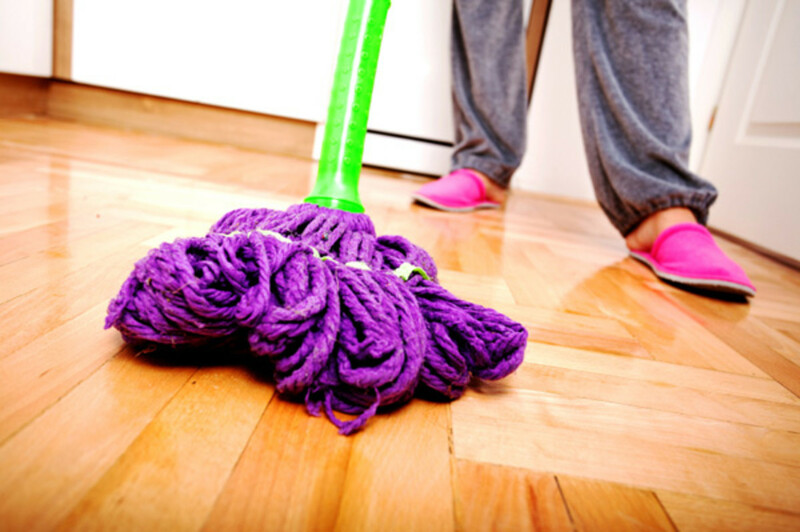 While we want to keep our floors clean, speed is secondary to convenience and ease of use. An electric mop could be exactly what we need. There are several varieties of these devices available. Because I prefer to deal with companies I know and trust, I limited my choices to Vanigo’s Roll580 and Bissell’s Spinwave Cordless Hard Floor Mop. 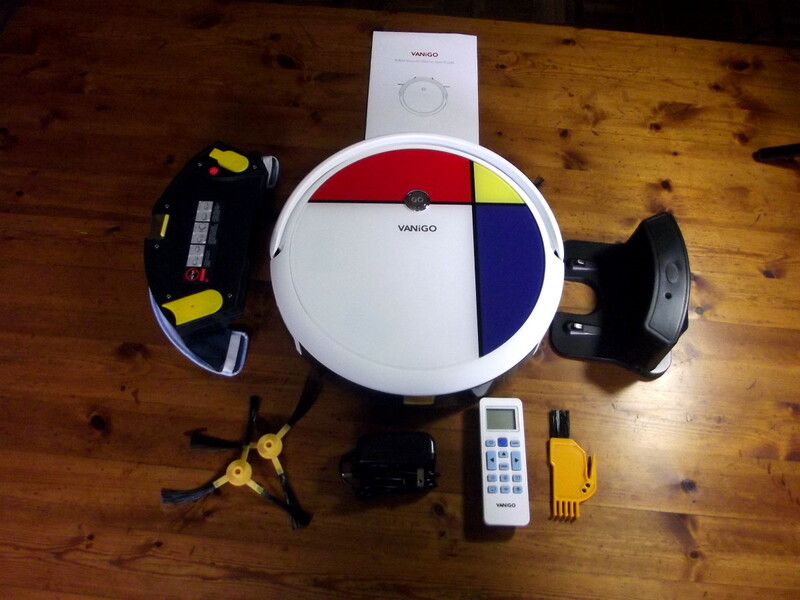 I liked the Vanigo robotic vacuum I reviewed last year and decided to purchase their version of the electric mop. 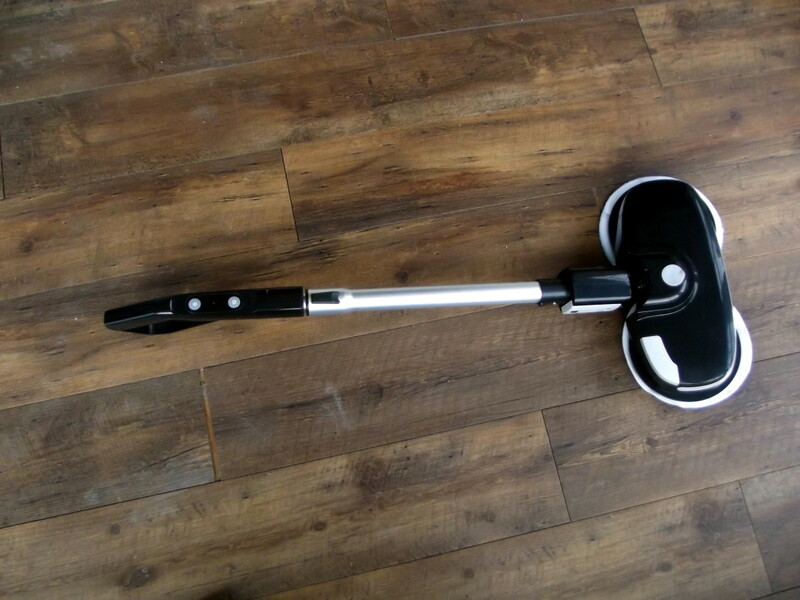 The basic electric mop evolved from the floor buffer, modernizing its design and repurposing this device for use as a floor cleaner. 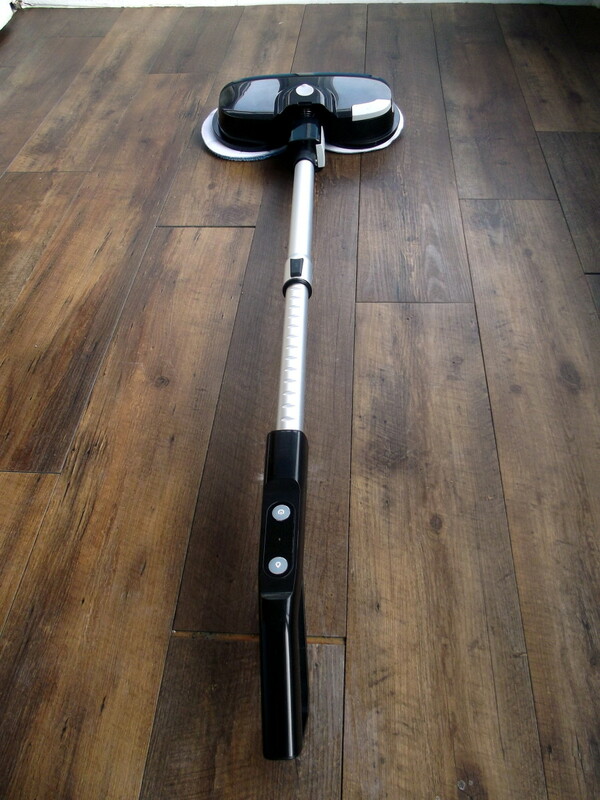 The main body of a Vanigo electric mop is composed of black-colored plastic. It contains an electric motor and a tank capable of storing 250 milliliters (8.5 ounces) of either water or waxing oil. A spray nozzle and a headlight composed of five LEDs are positioned at the front of this unit. Its top-mounted, foot-activated switch turns on the LED panel and provides power to the mop. 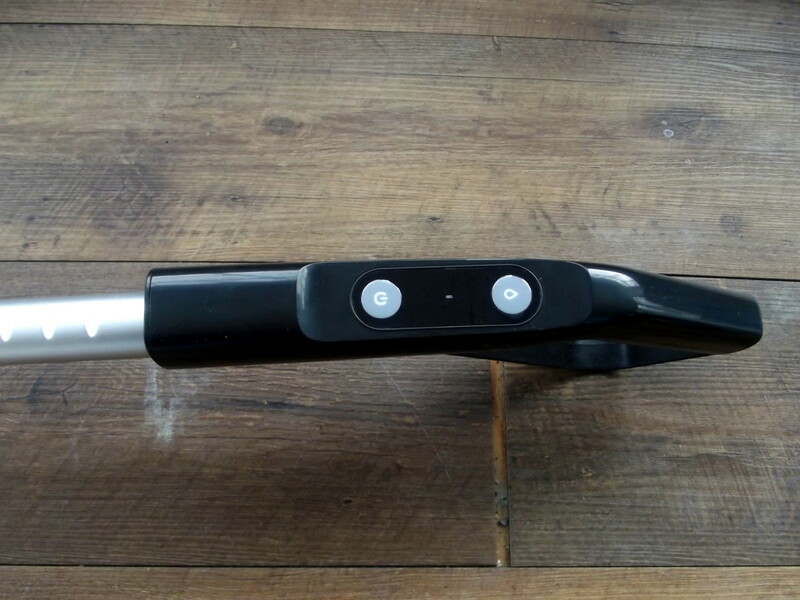 A specialized connector, which allows a range of movement, links the mop body to its handle and battery compartment. 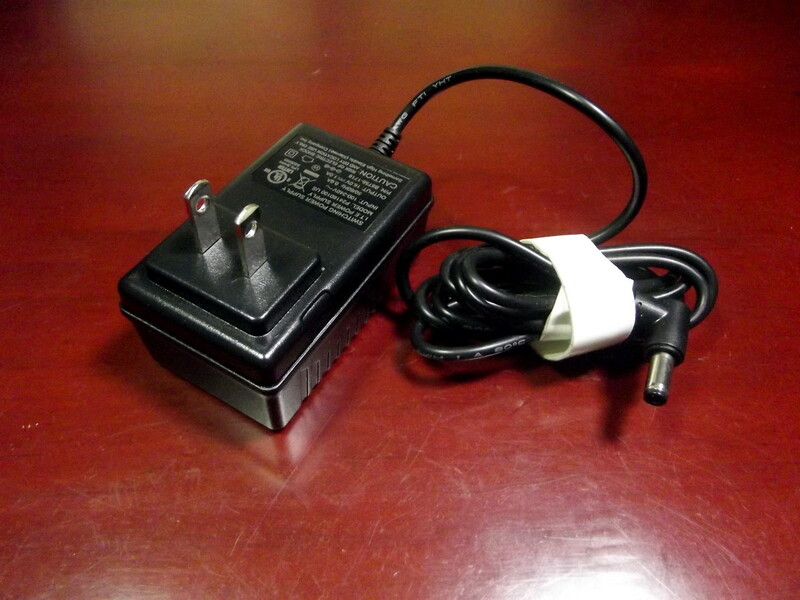 The 2200mAh lithium battery may be removed for charging. 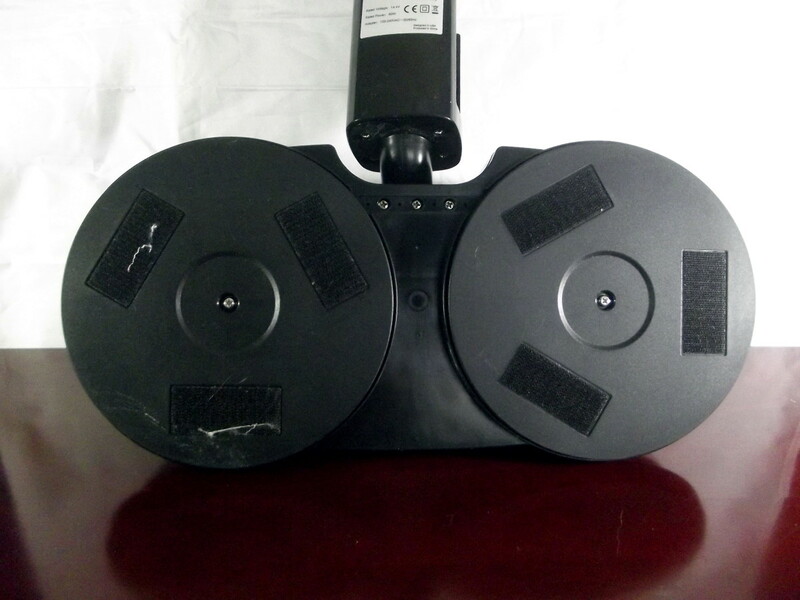 Two 18-millimeter (7 inches) disks, capable of spinning at 250 RPM, are fitted to the bottom. 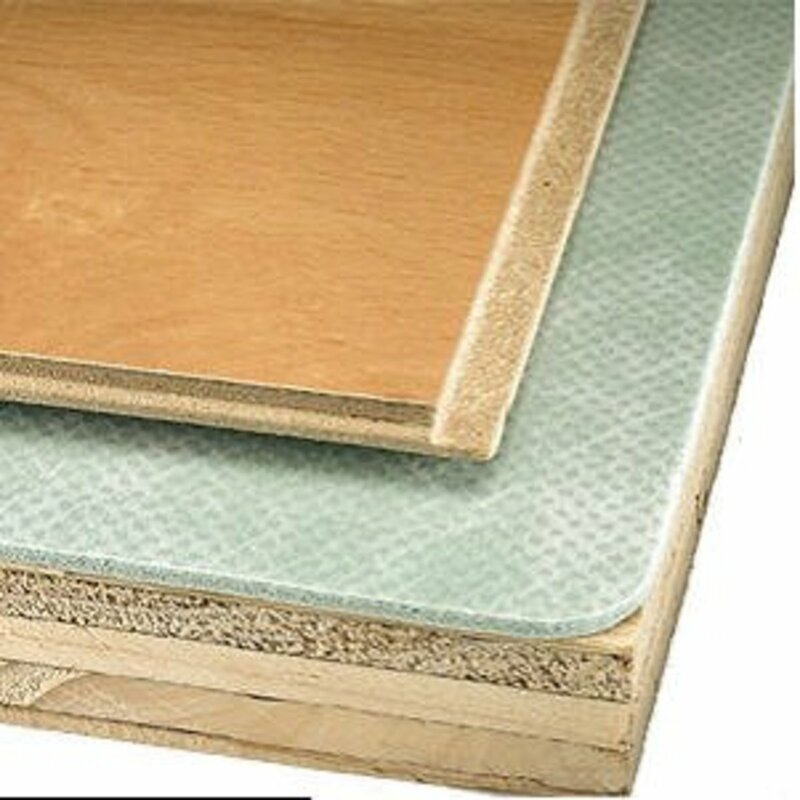 Thick cleaning pads can easily be attached, using Velcro strips. The Vanigo Roll580’s handle is extendable, ranging from 69 centimeters (27 inches) in length to 97 centimeters (37 inches). 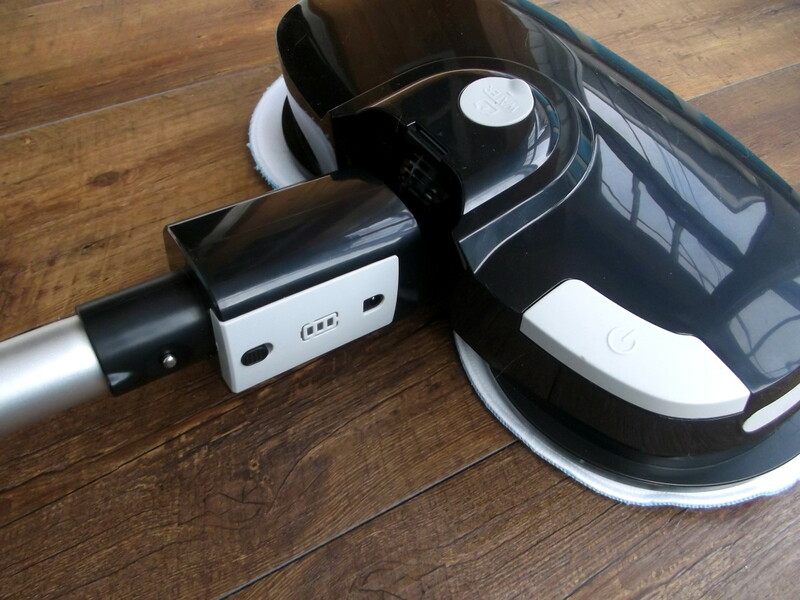 Although the electric mop’s footswitch provides primary power, the device’s spinning disks are controlled by the handgrip’s power button. Another pushbutton activates the mechanism used to spray water ahead of the electric mop. This handgrip also contains a second compartment which houses two AAA batteries. 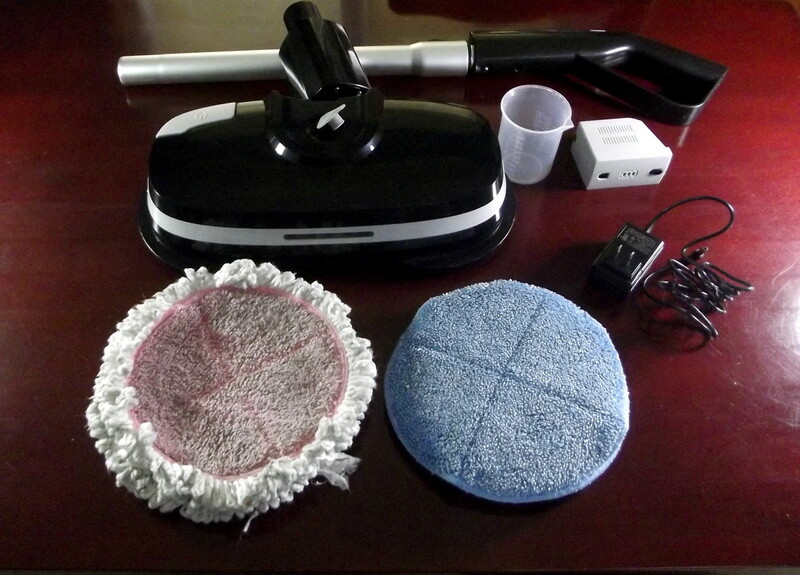 The electric mop shipped with a user’s manual, plastic measuring cup, two scrubbing pads, recharging unit, and a pair of buffing pads. The pads are composed of nanofibers which are considered a step up from microfiber. Vanigo is trademarked by Guangzhou Zhiying Technology CO., LTD. Vanigo’s sister company, Moman Technology Limited, is a vendor of photographic equipment. A label on this mop indicates that it was designed in the United States and manufactured in China. 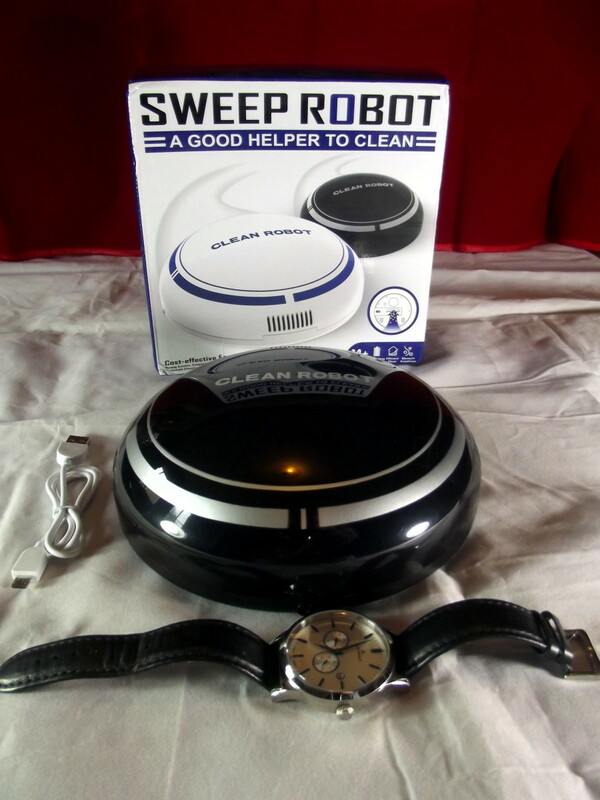 This device is also marketed as the MOPA580 Electric Mop by, American based, Mamibot Manufacturing. It required only a couple of minutes to assemble the electric mop. I then removed the battery and connected it to the charger for two hours. Later, I reconnected the battery and filled the mop’s water reservoir. 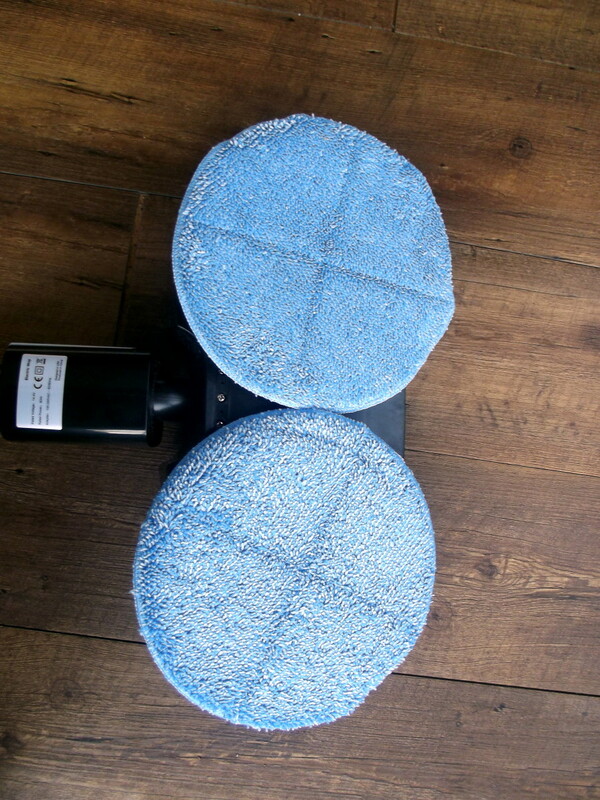 Although it is not stated in the guide, I decided to soak, and wring dry the scrubbing pads before attaching them to the electric mop’s disks. My first test went poorly because I was unused to the machine. By the time I’d scrubbed the kitchen and dining room floors, the battery was exhausted, and I had fully depleted the water reservoir. The next trial proved successful. After cleaning the entire house, there was enough battery power remaining to scrub the kitchen floor a second time. And, because I’d been more economical with the spray button, some water remained in the reservoir. 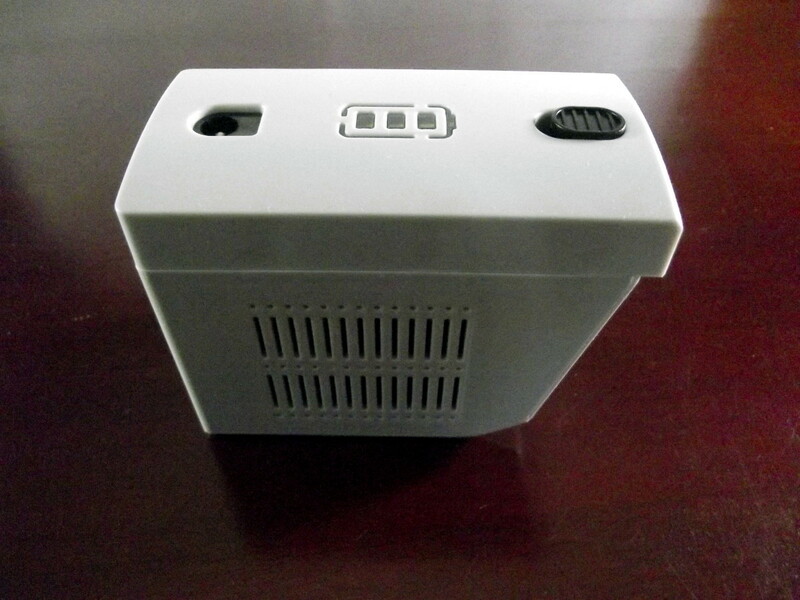 The battery lasted a full 40 minutes, suggesting this device could clean a small- to medium-sized house before requiring a recharge. While a string mop can reach smaller and tighter areas, the Vanigo ROLL580 proved more maneuverable than expected. The only spots it could not adequately cover were behind the toilet and tub of my cramped bathroom. 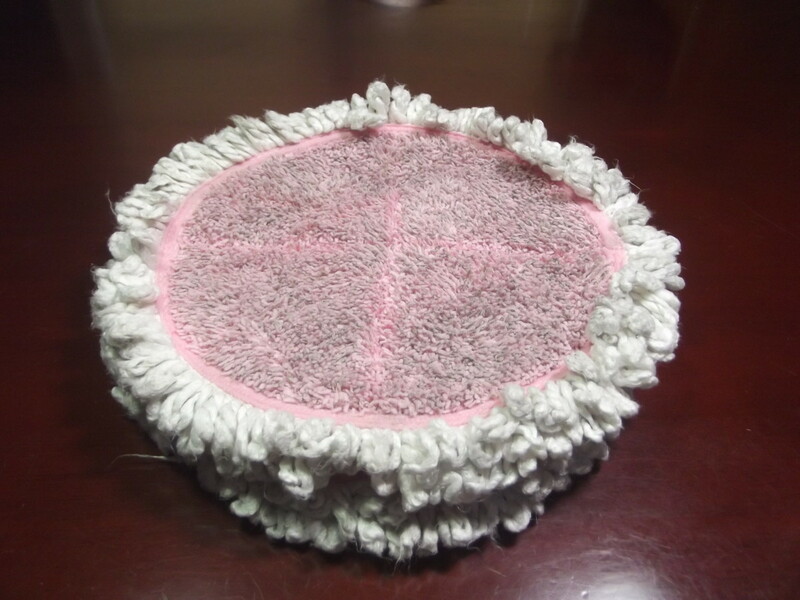 A short fringe rings the scrubbing pads. This helps to clean tight areas but sometimes catch on objects such as a protruding nail head. When this occurs, the pad might tear away from the disk. Since the pads attach with Velcro, you simply press them against the disk and continue to clean. This electric mop scrubbed my floors spotlessly clean. That was no surprise considering that two damp nanofiber pads were spinning away at 250 revolutions a minute. 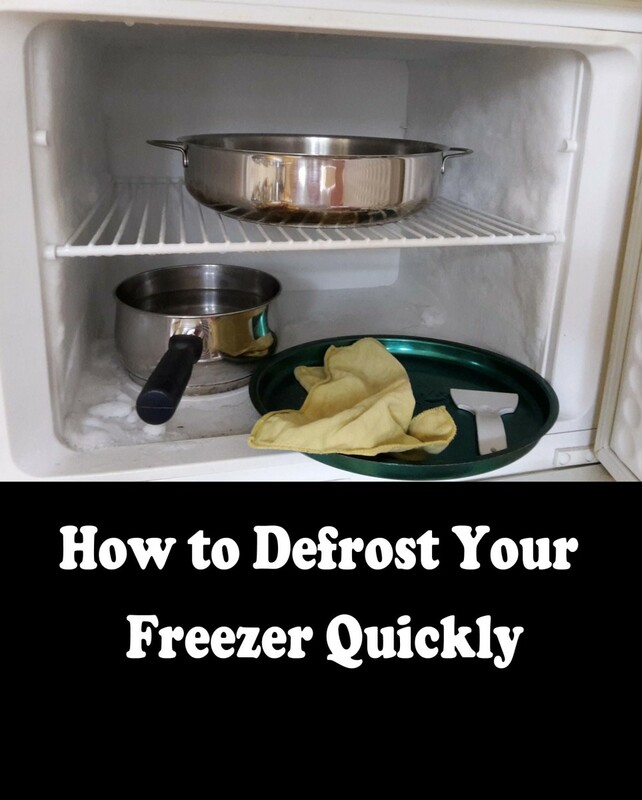 Because minimal water is used, only a slight and quickly drying film remains as the electric mop cleans. As with my string mop, this device leaves a noticeable swirl on shiny wooden floors. Once I pick up a container of waxing oil, I plan to go over these floors again, buffing out the swirl and improving the shine. Vanigo’s electric mop is, in my opinion, a light to medium duty device, suitable for household use. A hard-plastic connector links the mop’s body to its handle. 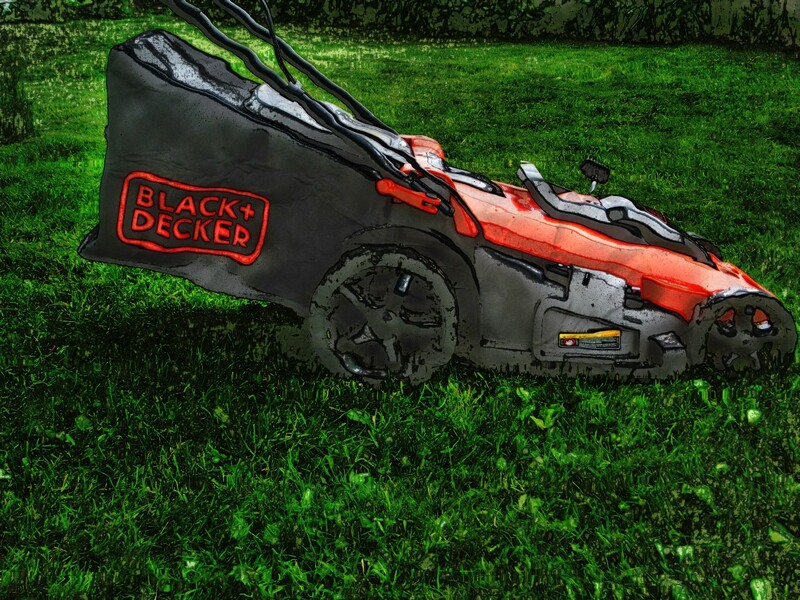 This twists in a variety of directions, providing good maneuverability to the device. While it satisfactorily passed my stress test, I would have preferred a connector composed of metal. 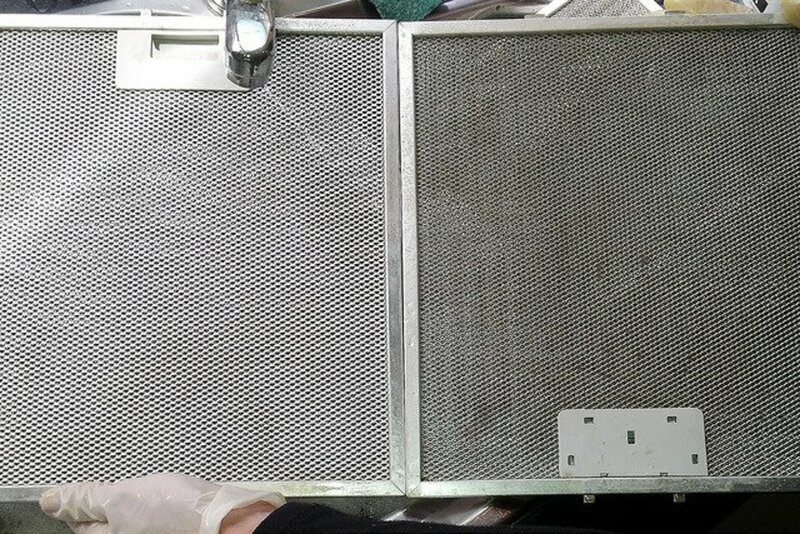 The water reservoir should be drained once cleaning operations are complete, in order to avoid gradual leakage from the spray nozzle. I liked the scrubbing and buffing pads. They should provide long service, and I expect that replacement costs will be reasonable. Throughout a 40-minute cleaning routine, I briefly stopped three times and moved furniture out of the way. None of these interruptions lasted longer than 30 seconds. The machine exhibited no sign of overheating, and its disks continued to revolve at a constant rate. No problems were observed. Although upkeep costs, in the form of replacement pads, should be minimal, the purchase price of an electric mop is higher than that of competing products. In addition, I can clean faster with a normal mop and scrub areas too cramped for an electric mop to reach. If, however, the ability to scrub floors effectively is your main concern, you will be impressed by this device. With little physical effort on my part, this electric mop cleans floor far better than any other device I have used. For this reason, the Vanigo ROLL580 is recommended. There are a large variety of devices to choose between when you clean your floor. In the following poll, I am attempting to determine what my readers prefer to use. What device do you use to clean your floors?